There are 39 individually decorated bedrooms on the 2nd, 3rd and 4th floors, each has a private bathroom and all rooms are within the same historic building. (The 1st floor is all public space.) There are two King bed suites available for that special evening. The other 37 standard rooms are anything but “standard”. Most guest rooms have either a queen or king bed, or two double or two queen beds. There are several suites comprising of two bedrooms with one private bathroom which is ideal for families. Free Wi-Fi access is available in the bedrooms and throughout the Inn. Each room has an individual window air conditioner during the warmer months. A highly recommended historic Vermont Inn. 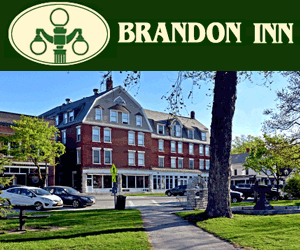 Ask us about Brandon, Vermont vacations. If you would like to add your Vermont Country Inn, Lodge or Bed Breakfast Inn to this web site, please contact us.